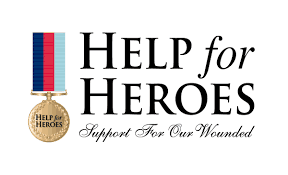 Help for Heroes is a British charity launched on 1st October 2007 to help provide better facilities for British servicemen and women who have been injured in the line of duty. Over the past 10 years, we have pledged to not only support those affected by their time in the Armed Forces but their families as well. The work we do is to give them and their loved ones a second chance at life, to reach their potential and to live fulfilling lives once more. We have managed to help more than 17,000 of our wounded, injured and sick – that’s 1 in 5 of those that need us most. We want to support even more people in the future, and we can’t do it alone. So that we can be here for our Heroes, whenever they need us, we are asking you to join The Force for Good. Together we can harness the expert minds, skilled bodies and courageous hearts of those who need us the most. Together we can help those who haven’t come forward yet and make a real difference. Giveacar and its donors are proud supporters of Help for Heroes as they work hard at providing support for those men and women injured in the line of duty. If you’re planning to scrap or sell your car, give a car instead to help those affected by their time in the armed forces. Your donation can ensure these people who were injured in the Armed Forces get a second chance at life. Do a good deed and help Help the Heroes when you donate your car to charity.